To celebrate Women's Sport Week and the start of the FIFA Women’s World Cup in Canada this weekend, the Football Association has launched a month of free football sessions for girls and women. As England prepare to kick off their World Cup campaign against France on 9 June, the FA hopes that the tournament will encourage more women and girls to get involved in the national game. FA Skills: After school football sessions for children aged between five and 11, ran by professional FA coaches. Sessions help develop children’s confidence, social skills fitness and technical ability. Football Mash Up: Coaching sessions for those aged 12-17, designed to develop skills and fitness. The FA Mars Just Play: Social football for adults – featuring kickabouts suitable for people of all levels of fitness and ability. Football is England's number one team sport for women and the FA hopes the game - which they say is already "thriving" at all levels - will benefit from the World Cup in the same way that it did from the 2012 Olympics. According to latest FA data, nearly 2.5 women and girls play football, while there are now 35,000 qualified female coaches and over 900 qualified female referees. Kelly Simmons, Director of the National Game and Women’s Football at the FA, said: “The profile of Women’s football has never been greater. "At the top of the game, the England team goes into the World Cup in great shape and the FA Women’s Super League continues to go from strength to strength. “At grassroots level we are delighted with the progress being made. 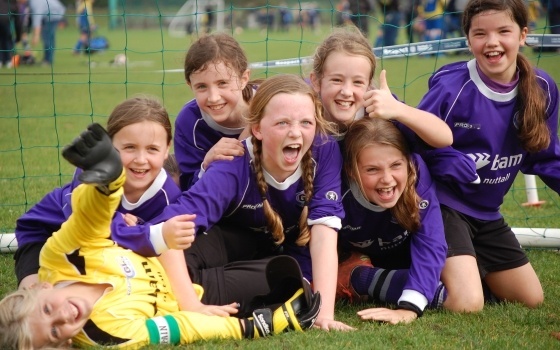 There is an array of exciting ways for girls and women of all ages to get into football. To enquire or book a session visit thefa.com/play-football. Women’s Sport Week, which runs from 1-7 June, is an opportunity for everybody involved with playing, delivering, leading or working in sport to celebrate, raise awareness and increase the profile of women’s sport across the UK. Led by Women in Sport, the week is supported by national governing bodies, Sky Sports, the BBC, Sport England and supporters from across the sport sector. To find out more visit womeninsport.org or join the conversation on social media using #WSW2015.